Blemishes are spots on the skin that decolorizes it. The acne is said to be the main reason for the break out of blemishes. There are other factors also that are said to cause them. The list includes aging, improper diet, overexposure to sun and changes in the hormones. The genetic factors are inevitable and also cause blemishes on the surface of the skin of the people. Often the pores in the blemishes are blocked and they result in the formation of blackheads, pimples, whiteheads and pustules. They can be seen anywhere on the body but are common in the face, hands, legs and the back. There are many products in the market that helps to eradicate blemishes on the skin. It is manufactured with the help of chemicals and is harmful to the body. But the natural home remedies are not harmful and are smooth on the skin. There are several natural cures available for Blemishes. 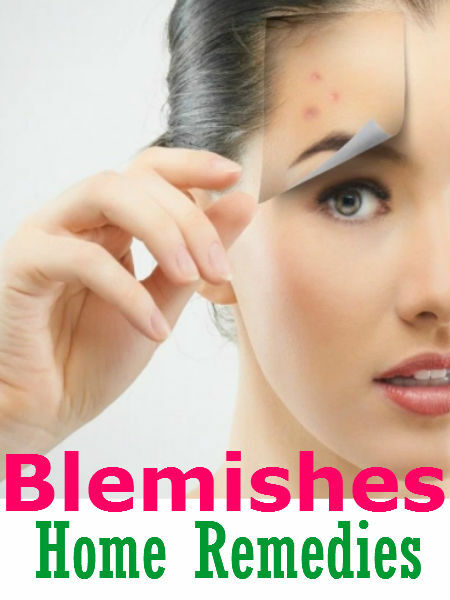 The blemishes can be removed at home itself. Let’s see the simple ways in this article. The lemon is rich in exfoliating properties that help to clean the excess oils and bacteria that are present in the skin. The lemon acts as the skin lightening agent that helps to lighten the skin and clear it off the blemishes. The lemon juice that is got by squeezing it can be applied on the blemish twice a day. The lemon juice can also be mixed with fresh honey and smeared on the blemishes. When done repeatedly, it helps to clear the skin off the blemishes. After fifteen minutes it must be washed off. The tomato is rich in antioxidants that help to clear the pores that form on the surface of the skin. It helps in achieving the glowing skin with the help of astringent properties and the vitamin C. The lycopene present in the tomatoes helps to lower the suntan on the surface of the skin. The peels of tomato must be applied on the face and washed after twenty minutes. This must be followed till a person achieves their purpose. The apple cider vinegar helps to equate the skin’s pH levels and cleans the clogged pores. The alpha hydroxyl acids in it help to moisturize the skin and keep it shiny. One part of apple cider vinegar must be mixed with three or four parts of water to apply it on the face. A cotton ball must be dipped in the solution and applied on the face. Cold water must be used to wash the face after fifteen minutes. The application must be tried for at least twice a day. The potato reduces the skin blemishes with the starch content that it has. The potato helps to reduce the dark circles. A potato must be smashed and made into a pulp with a little amount of water added to it. A cotton ball is used to apply the potato juice on the blemish and must be washed after fifteen minutes. The process must be repeated for at least thrice a week. The fuller’s earth is a great exfoliating agent that clears the dead skin parts from the face and imparts a glowing look to the face. Two spoons of fuller’s earth must be mixed with water in order to form a paste. It can be applied on the face and left to remain on it for about half an hour. The face is washed with cold water. Besides water, sandalwood oil, rosewood oil, lemon juice and honey can be used to mix the fuller’s earth into a paste. The fuller’s earth must be used thrice a week to obtain the desired effects. The Aloe Vera gel helps to clean the dead skin cells and blemishes from the surface of the face. The gel stimulates the growth of fresh skin cells to grow. The gel can be extracted by cutting the leaf of the plant. The gel can be either applied as it is on the blemish or can be mixed with other carriers like lemon juice or tomato juice. The repetitive process of using it daily can decrease the blemishes in a week. It is loaded with vitamins and nutrients. The other natural ingredients include salicylic acid and vitamin C. They help to open the skin pores and reduce the blemishes on the skin. The strawberry must be smashed and mixed with honey, oatmeal and egg white. The paste must be applied on the face and wiped after fifteen minutes with the help of a warm cloth. For several weeks this procedure must be repeated. The orange is full of antioxidants that help to clear the pores formed on the skin. The powder of the orange peels must be mixed with honey and yogurt. It must be then applied on the face and the other places where the blemish has occurred. They must be washed after twenty minutes and it must be repeated twice a day for about two weeks. It helps to eradicate suntan also. The banana fruit is rich in antioxidants that help to decrease the swellings. Potassium content helps to form new cells and restores the healthy glow to it. The face or the place where the blemish has occurred must be applied with the inside of the banana peel for some time. It need not be rinsed with water. It must be left as it is. It must be done thrice a day. It helps to reduce the blemishes on the skin with the help of antioxidants and reduces the dark circles and suntan. The cucumber must be squashed and with a little amount of honey must be applied on the blemish. Doing it twice a day for about a week can lighten the blemish.